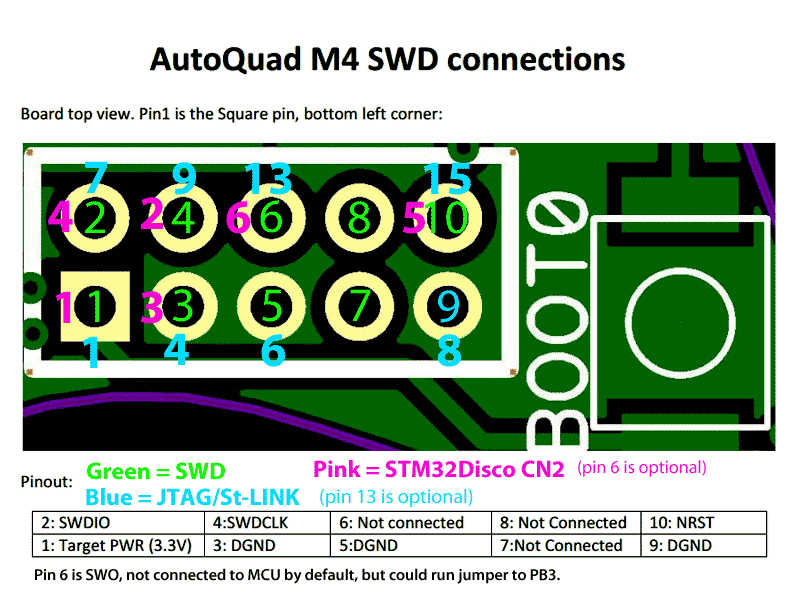 After connecting the M4 to a 1S LiPo you can switch the board on/off via the small push button, located between arm 2 and the GPS module (see reference image above). 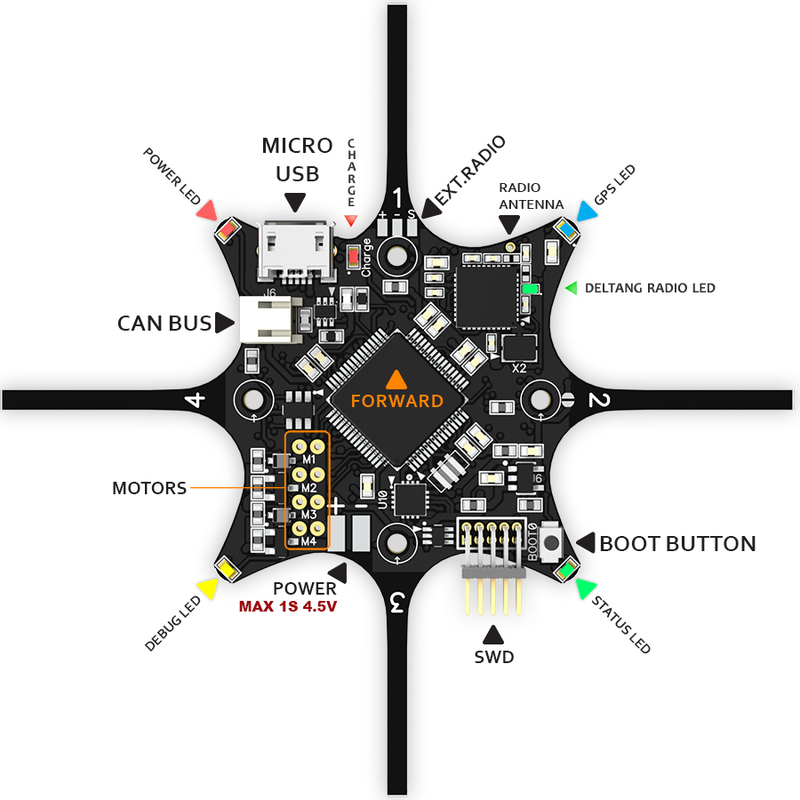 When using a USB connection, the M4 turns on automatically. 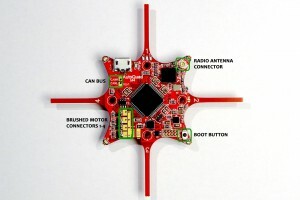 Don’t attempt to fly on USB power alone! 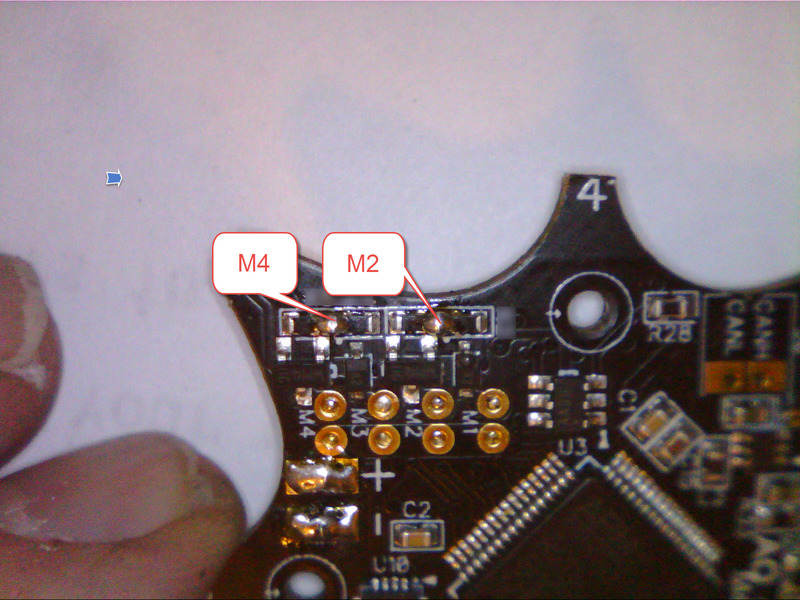 Note: On the M4v2 production board the bind process will be indicated by the YELLOW LED. Note: On the M4v2 the yellow LED indicates radio operations. Fast yellow flashing means “Binding Mode”. Solid means “Connected”. 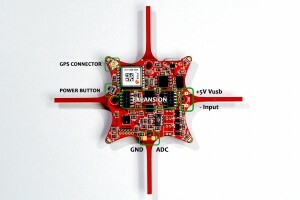 the LEDs will flash rapidly, then blink slower until they go solid for a second and then show normal state. Please refer to the page describing the Onboard Calibration functions. 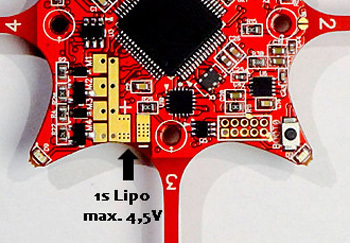 When the lipo has reached stage 2 of the lipo alarm, green and yellow LEDs will flicker simultaneously to signal a critical condition of the power supply. 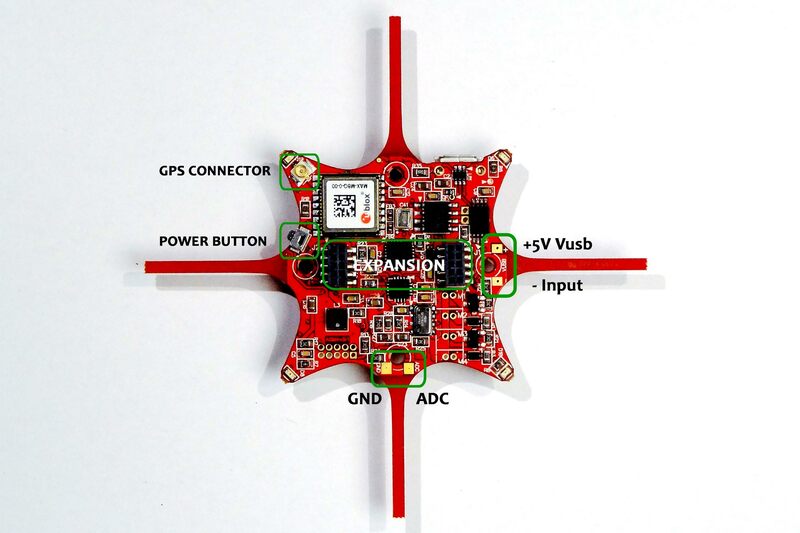 You can adjust it to your needs: set low level stage 1 to 3.5V and stage 2 to 3.3V. Depends on your lipo. Bring the copter down as soon as level 2 alarm kicks in! 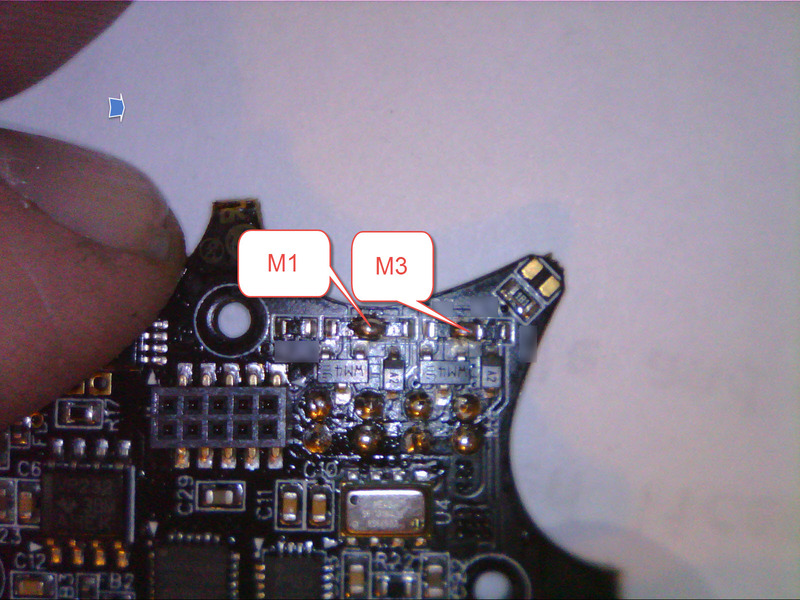 If you are not using the onboard brushed motor ESCs, and are very handy with a soldering iron, you can tap into the motor 1-4 outputs directly. 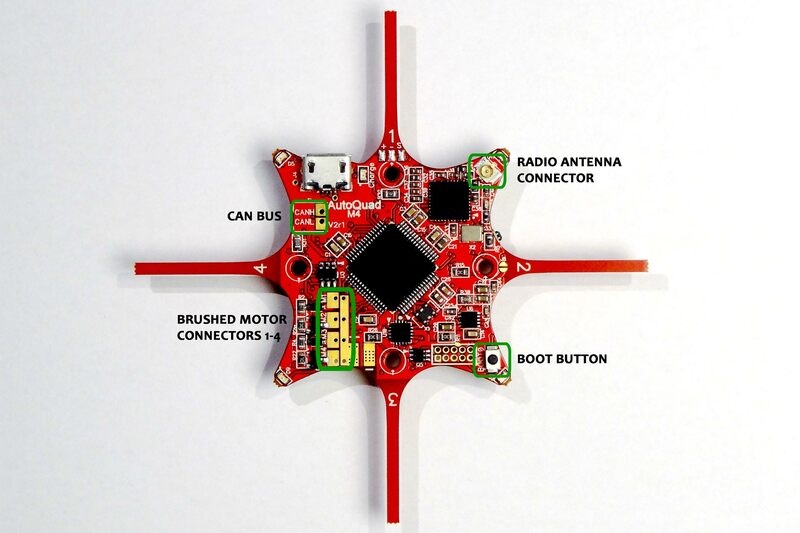 For example to connect a brushless ESC or to use AQ signaling features. Here are a couple pictures showing where to pick up the signal from. This page was created on 8-Aug-14 by kinderkram. Last modified on 12-Nov-16 by MaxP.